The Queqiao ("Magpie Bridge") satellite was blasted into space from the southwestern Xichang launch centre in the pre-dawn hours, according to the China National Space Administration. 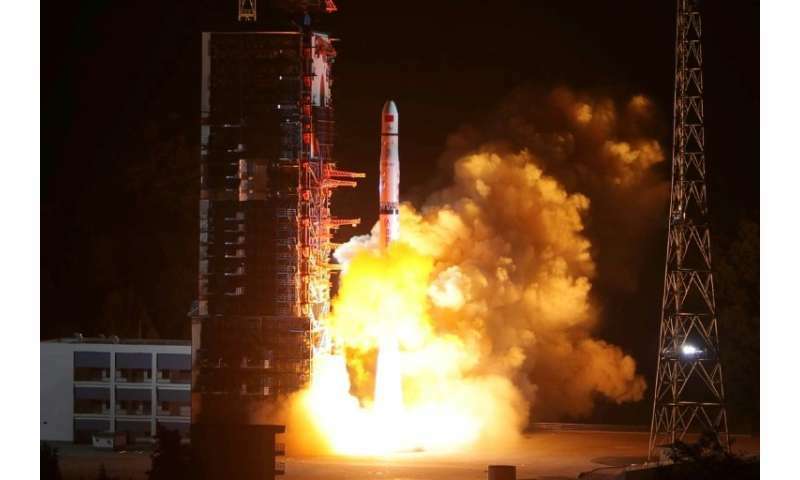 The satellite split from its carrier, a Long March-4C rocket, after 25 minutes and unfolded its solar panels and communication antennas, as it headed towards its destination, the CNSA said. "The launch is a key step for China to realise its goal of being the first country to send a probe to soft-land on and rove the far side of the Moon," Zhang Lihua, manager of the relay satellite project, was quoted as saying by the official Xinhua news agency. The satellite will relay communications between controllers on Earth and the far side of the moon, where the Chang'e-4 lunar probe—named after the moon goddess in Chinese mythology—will be sent later this year. Also known as the "far side" of the Moon, the far hemisphere is never directly visible from Earth and while it has been photographed, with the first images appearing in 1959, it has never been explored. The Chang'e-4 rover will be sent to the Aitken Basin in the lunar south pole region, according to Xinhua. It will be the second Chinese probe to land on the Moon, following the Yutu ("Jade Rabbit") rover mission in 2013. At first, the Yutu looked destined to fail when the rover stopped sending signals back to Earth. But then it made a dramatic recovery, ultimately surveying the Moon's surface for 31 months, well beyond its expected lifespan. The CNSA is planning to send another lunar rover, Chang'e-5, next year to collect samples and bring them back to Earth. The term "dark side of the moon" is completely ignorant and shouldn't be appearing at the head of an article about science. It's actually the far side of the moon. "Earthshine does not reach the area of the far side which cannot be seen from Earth"
"The word "dark" has expanded to also refer to the fact that communication with spacecraft can be blocked while on the far side of the Moon, during Apollo space missions for example." -the term 'dark' often used to describe out of sensor range. Thanks otto, I hadn't thought of the second reason for using the phrase 'dark of the moon'. Dark in that context would imply a natural process. While the term black-out would imply a man-caused artificial interruption of sight and communication. Both dark and far are relative terms. To those of us on terra firma, the far side of the moon is always dark in that we cannot see it. This will eventually change, as will the relevance of both far and dark as descriptors. Once the moon has been fully colonized, the idea of "far side of the moon" will likely be a thing of the past. At any rate, both far and dark are subject to the observer. Therefore, it doesn't make much sense to criticize the title of the article. TL;DR - You're being a tool. Don't be a tool. Some other terms will undoubtedly change. And MrB, I am being a left-handed monkeywrench, for your fabulist belief in human colonization of the Moon? I got three words for you, Jamestown, Roanoke, and Plymouth. Only thing the moon is good for, maybe, will be automated facilities to support orbital industries. And even then it won't take a century before distributed orbital facilities make the moon bases obsolete and abandoned. Just like the tens of thousands of ghost towns and abandoned industries across North America. No it doesn't. The context is technology and exploration; what can be seen and what can't, like bojangles said. "Going dark is military lingo for the sudden termination of communication." "The dark web is the World Wide Web content that exists on darknets"
"...in a state of ignorance about something. "we're clearly being kept in the dark about what's happening""
-It has always meant out of view. It was a British description that got mangled out of ignorance, not the other way around. The people who coined it knew full well that they could see what part of the moon was in darkness. Earthshine, according to NASA, produces 35 times more light on the Lunar surface than does a full moon on Earths surface, so it will be interesting to know the light levels on the far side. I really hope they succeed with this mission, but I have my doubts. What does science call the "dark side of the moon"? That's why the moon has always one of its sides facing Earth! And why is this a natural law of movement? Science knows nothing about it, because it does not know the natural laws of the movement of celestial bodies. I am trying to explain this, but nobody from the scientific circles wants to think about it and that's why many theories are tempting to learn. Looks like someone listened and updated the article. And MrB, I am being a left-handed monkeywrench, for your fabulist belief in human colonization of the Moon? Humans have a propensity for doing grandiose things simply because we can. For example, launching a Tesla car into space was completely unnecessary, but it's awesome that we did it. It's a testament to our curiosity and resolve. Undoubtedly the same will be true for living on the moon for some individuals. We also do things out of competition, such as with the Soviet Union during the cold war. Only thing the moon is good for. . . Just like the tens of thousands of ghost towns and abandoned industries across North America. I'm not sure I agree with this either. Mining helium-3 could potentially be an extended operation. The far side might be used as a forward base for further exploration in the solar system as well. At any rate, the point is calling it dark vs far is relative and subjective, and for barakn to call the author ignorant is lame in that regard.